Did My Kids and I Go Ape for Primates or Pirates? Bruce Fretts: Well, kids, we’ve seen two movies this weekend: the British cartoon The Pirates! 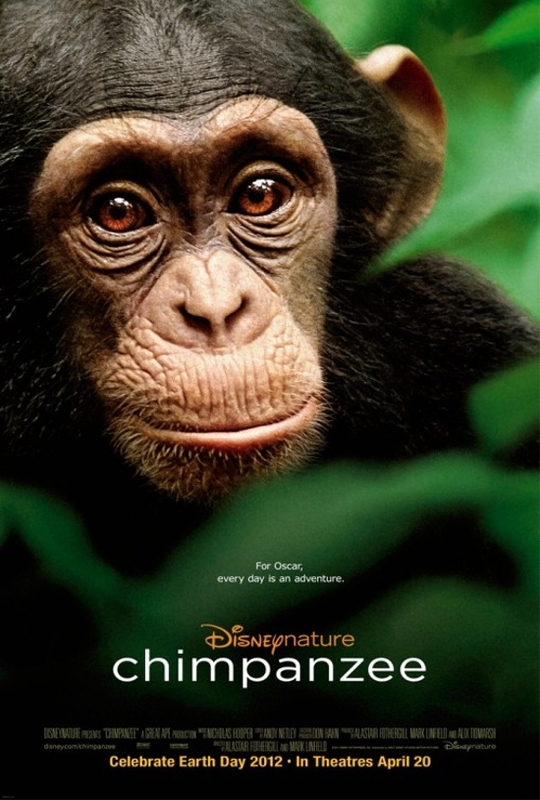 Band of Misfits and the Disney Nature documentary Chimpanzee. The question is: Did you go bananas for either of them? Olive: Uhhhh! Why do you always have to come up with a pun? Jed: I choose not to comment, because I fell asleep during both movies. Olive: I’d give them both a 4 on a scale of 1 to 10. Tim Allen really ruined the Chimpanzee cuteness. Bruce: I agree. Tim Allen was a poor choice of narrator. It just seemed like Disney was trying to make you think of Buzz Lightyear. Olive: And also they wrote all these lines trying to be funny and cracking jokes. But if you try to be funny, you should actually be funny. Bruce: I thought they Disney-fied it too much. They named the bad monkey Scar, just like the bad guy in The Lion King. They didn’t need to do that. The story and the nature footage were good enough. But I loved Oscar. He’s the baby chimpanzee that is being raised by the good group. Olive: He’s so adorable! Especially when he’s 3 months old because he’s all small. Bruce: If you had been a boy, we would’ve named you Oscar. He kinda reminded me of you when you were a baby. Olive: I looked like a monkey? Bruce: Like a cute monkey! Bruce: I liked the scene where they ate the army ants. Olive: I didn’t like that because I could feel army ants biting my mouth. Bruce: What about the scene where they eat the other monkeys? Olive: I didn’t like that. It was weird. It freaked me out. They didn’t show the monkey dying, so it seemed like they just ripped out his bones when he was alive, which I hope wasn’t the case. Bruce: Well, there was also a monkey in The Pirates, Mr. Bobo, who was the best thing in it. He would hold up signs like “Uh” and “Oh.” Why didn’t you like the movie? Olive: It was just too immature. You know, your kind of jokes. Bruce: I disagree. I thought it was somewhat sophisticated humor. It was very dry. Do you know what dry humor is? Olive: Yeah, that’s what I was about to say. It was very dry—your kind of humor. Bruce: I don’t know if my humor is dry, but it seems ironic that a pirate movie would have dry humor since they’re always on the water. Get it? Jed: This is why I’m not doing the chat. Bruce: I thought the Pirates trailer made it look like it was going to be much more fast-paced. It was actually slow and British-feeling. It wasn’t like a big, loud, noisy American cartoon. That’s why I liked it. It was subtle, which doesn’t necessarily appeal to kids. Olive: I just didn’t like it. Bruce: It didn’t make you laugh? Olive: No, it made you laugh. Bruce: But you liked David Tennant? Olive: He’s my favorite Dr. Who. He’s awesome and, like, alert and stuff. Bruce: He does the voice of Charles Darwin, which is interesting. I didn’t realize they were going to incorporate real historical figures like Queen Victoria and Darwin. Olive: Charles Darwin is a real person? I didn’t know that. Who is he? Bruce: He’s the founder of evolution. Bruce: He studied all kinds of different animals and found out that we are evolved from… monkeys! Jed: No, monkeys and humans share a common ancestor. Bruce: Would you care to explain the difference? Bruce: It all comes down to monkeys. So my final verdict is I liked Chimpanzee better than The Pirates because it had more monkeys. Olive: I’ll raise The Pirates to a 5 because I liked David Tennant and Polly, the parrot who’s actually a dodo. She was adorable. And I’ll raise Chimpanzee to a 6 because monkeys are cute. Bruce: I felt like I could relate to the monkeys more than the pirates. Olive: Because you are a monkey. Bruce: And what does that make you? Bruce: How does that work? Olive: It’s just the facts of life, Pop. Which do you prefer—primates or pirates! Post a comment, matey! again I like your reviews with your kids! You have taught them well! « Is It “Safe” to See Jason Statham’s New Flick?